Lately, I’ve been consciously eating less meat and experimenting with more Vegetarian dishes, and generally I feel a lot healthier for it. 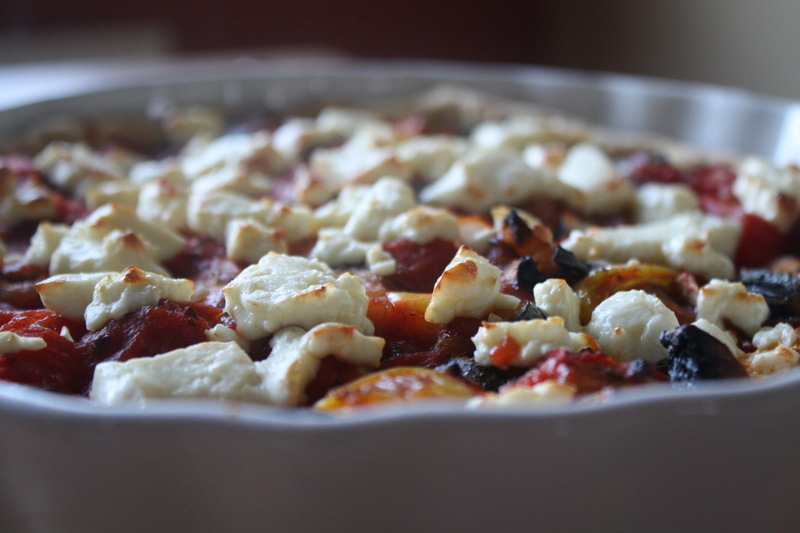 One of my favourite dishes is a simple tart made with roasted vegetables, tomatoes and a little feta. Andrew’s Mum also recently taught me a great potato dish that goes pretty well with it, although you could easily skip the extra carbs and just serve it with a nice big salad. A selection of vegetables: I used about 1/3 of an aubergine, 1/2 yellow pepper, 1/2 red pepper, 1/3 courgette and 1/2 an onion but you could add a lot more depending on what you have in the fridge. 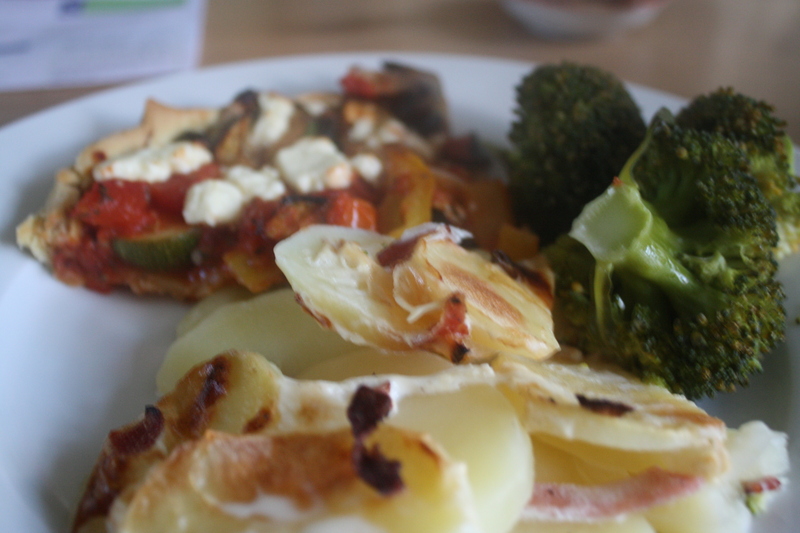 Chop the vegetables and roast them with a little olive oil. Put the flour and salt in a bowl with cubes of the butter. Rub together to make crumbs. Add water gradually, using a knife to bring the pastry together. Wrap in clingfilm and put in the fridge for 10-15 min. When it has been in the fridge for about 15 minutes, press it into a flan dish, cover with baking beads and bake for about 15 minutes. Meanwhile heat your tinned tomatoes with salt, pepper and a sprinkling of herbs (dried mixed herbs work fine, but if you prefer add fresh herbs such as rosemary or thyme when you’re roasting the vegetables). Once the pastry looks almost cooked, remove the beads and add the roasted veg and about half the tin of tomatoes and return to the oven for about 15 minutes. Add crumbled feta for another 5 minutes before serving. Slice your potatoes, and chop the onions and bacon. Arrange them in layers in an ovenproof dish. Cook in the oven on 180 degrees for about an hour and a half.